Nunchaku are only legal in these states if you are a student or teacher in a legal martial arts school registered with your state. It is the buyers responsibility to know your local laws regarding the purchase and use of any martial arts weapon. The buyer agrees to these terms and conditions upon check out and takes responsibility for the purchase of these items and there use according to the local laws and regulations of the buyer. Shipping Time — Most orders are shipped within 1-5 business days depending on the shop load and the items status.. Orders are not processed or shipped on Saturday or Sunday. Most deliveries take around 2-3 business days to arrive depending on the shipping method selected. USA Nunchaku sells handmade items and is not a drop ship company. Not receiving your order in the 1-5 business day estimate is not grounds for an automatic cancellation or refund. USPS Priority: We can not and do not guarantee the USPS Priority 2 or 3 day time frame the postal service offers. This is a time frame set up by the United States postal service and can be delayed by any number of events that we as the shipper do not have any control over. Order Arrivals: We cannot guarantee when an order will arrive. Consider any shipping or transit time offered to you by USAnunchaku or other parties only as an estimate. FIRST CLASS INTERNATIONAL: When placing international shipping orders with US Postal service “First Class International” We have no control over your package once it leaves the United States. American Nunchaku Company and usanunchaku.com are only responsible for your package up until the point it leaves the country of the United States. From that point forward the customer’s national postal service and customs office are responsible for your package, it’s whereabouts and ultimately it’s delivery. International duties, tariffs or taxes: All customs charges are 100% out of the control of the Seller. This includes duties, tariffs and or extra taxes. The tax is levied by your country and your country alone. Not every package is taxed but it is your responsibility to pay the tax if your county tells you to. It is your responsibility to know the laws of your own country. Customs clearance procedures can cause delays beyond original delivery-time estimates. There is no set scale for what these charges may be and no way for a US buyer to know ahead of time. Unless otherwise specified, all materials appearing on this site, including the text, site design, logos, graphics, icons, and images, as well as the selection, assembly and arrangement thereof, are the sole property of USAnunchaku, Copyright © 2012-2014, ALL RIGHTS RESERVED. You may use the content of this site only for the purpose of shopping on this site or placing an order on this site and for no other purpose. No materials from this site may be copied, reproduced, modified, republished, uploaded, posted, transmitted, or distributed in any form or by any means without our prior written permission. All rights not expressly granted herein are reserved. Any unauthorized use of the materials appearing on this site may violate copyright, trademark and other applicable laws and could result in criminal or civil penalties. We accept the following credit cards: Visa, MasterCard, Discover and American Express and personal check. There is no surcharge for using your credit card to make purchases. Please be sure to provide your exact billing address and telephone number (i.e. the address and phone number your credit card bank has on file for you). Incorrect information will cause a delay in processing your order. Your credit card will be billed at the time of your order. At this time we do except personal checks. Orders will not be processed until checks clear 7 business days. For a multiple product order, we will make every attempt to ship all products contained in the order at the same time. Products that are unavailable at the time of shipping will be shipped as they become available, unless you inform us otherwise. You will be refunded for any products not shipped out. Your receipt of an electronic or other form of order confirmation does not signify our acceptance of your order, nor does it constitute confirmation of our offer to sell. 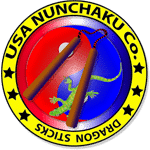 USA Nunchaku Co reserves the right at any time after receipt of your order to accept or decline your order for any reason or to supply less than the quantity you ordered of any item. These Conditions will supersede any terms and/or conditions you include with any purchase order, regardless of whether USA Nunchaku signs them or not. We reserve the right to make changes to this site and these Conditions at any time. We will ship your product as it becomes available. Usually, products ship within 2-3 business days and you can expect to receive them in about 5-7 business days. However, there may be times when the product you have ordered is out-of-stock which will delay fulfilling your order. We will keep you informed of any products that you have ordered that are out-of-stock and unavailable for immediate shipment. You may cancel your order at any time prior to shipping. We keep your personal information private and secure. When you make a purchase from our site, you provide your name, email address, credit card information, address, phone number, and a password. We use this information to process your orders, to keep you updated on your orders and to personalize your shopping experience. We do not store credit card information on this site.Our secure servers protect your information using advanced encryption techniques and firewall technology. To keep you informed about our latest offers, we may notify you of current promotions, specials and new additions to the USA Nunchaku site. You may unsubscribe from our newsletters by following the unsubscribe instructions in any email you receive from us. Please see our return policy for any defective product or product damaged in shipping. If a mistake has been made by us, we will pay the return shipping costs within 7 days. We guarantee all products are the same ones listed and all are sold as is. All sales are final baring some shipping error or destruction in transit. Our Store shall automatically charge and withhold the applicable sales tax for orders to be delivered to addresses within the same state. For orders shipped to other states, you are solely responsible for all sales taxes or other taxes. Canadian customers are solely responsible for any customs or tariff charges. In the event a product is listed at an incorrect price due to typographical error or error in pricing information received from our suppliers, USA nunchaku shall have the right to refuse or cancel any orders placed for product listed at the incorrect price. USA nunchaku shall have the right to refuse or cancel any such orders whether or not the order has been confirmed and your credit card charged. If your credit card has already been charged for the purchase and your order is canceled by USA Nunchaku, USA nunchaku shall immediately issue a credit to your credit card account in the amount of the incorrect price.